Note: The duration and difficulty of the daily excursions might be subject to variations depending on the number of participants and their requirements. Upon request of the participants, it is possible to go on easy via ferratas. What to bring: backpack - food and drink - light windcheater - mountain shoes - walking sticks. For the bivouac: tent - sleeping bag - mat - flashlight - gas cooker. Note: please calculate in the cost of your holidays ca. EUR 50,00 extra per day for half-board in small hotel (3 days). Duration: 3 to 4 hrs. - How is it: easy - Meeting point: highway exit Rovereto Sud/South - car park - 8.30 a.m. or in your holidays Hotel. Description: Trip in a particularly scenic landscape against historical background; departing from Rovereto with our mini-van, we are heading towards Arco until we have reached the starting point of our tour at Lake Tenno (ca. 45 min by car). In about 20 min. we will reach the medieval village Canale. A footpath through a forest will lead us to a mountain lodge which we will reach after about one and half hours. From there we can enjoy the unique panorama over the entire territory. On our way back we may stop and visit Canale village and admire the astounding turquoise-colored Lake Tenno. Back to Rovereto and/or your hotel. Duration: 4 to 5 hrs - How is it: easy - Meeting point: highway exit Rovereto Sud/South - car park - 8.30 a.m. or in your holidays Hotel. Description: Walking tour in a particularly scenic landscape - We are departing from Rovereto with our mini-van. Our main direction is Mori but prior we will turn off to Brentonico. All in all, after approx. 40 min. by car, we will get to a mountain lodge which is located at an altitude of 1.650 m. This is the starting point of our t trip. A path which has been constructed during World War I is leading us through the famous Natural Parc of Mount Baldo. After approx. 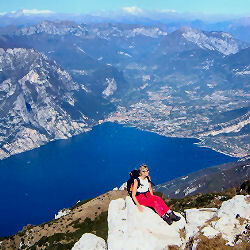 2 hrs., we will reach the Mount Altissimo top which is very close to an alpine lodge where we can have a break. Very often this peak is being called the "balcony" as from there it is possible to view the entire territory. Back to Rovereto and/or your hotel. Duration: 5 to 6 hrs - How is it: easy - Meeting point: highway exit Rovereto Sud/South - car park - 8.30 a.m. or in your holidays Hotel. Description: Walking tour in a particularly scenic landscape - departing from Rovereto with our mini-van, we are heading towards Torbole until we have reached the starting point of our trip at Ledro Valley (ca. 45 min by car). A footpath is leading us through meadows and pastures, passing characteristic alps. The difference of altitude which has to be mastered is ca. 700 m. We will take our lunch break on Peak Mughera, a mountain top located high above the Lake from where we can enjoy a fantastic view over the entire surrounding Dolomites chains. Descent to Limone ca. 2 hrs. From Limone back to Riva by ferry boat - end of the tour. Back to Rovereto and/or your hotel. Duration: 2 days - How is it: medium - Meeting point: highway exit Rovereto Sud/South - car park - 8.30 a.m. or in your holidays Hotel. Description: Tour with a very particular historical background in a very scenic landscape. 1st day - We are departing from Rovereto with our mini-van, after ca. 30 min we will reach a characteristic mountain village. This is the starting point of our trip. After about 3 hrs. by foot through meadows and passing alps, we will reach Peak "Col Santo" (2.112 m) which has been of great importance during World War I - descent to the mountain lodge Lancia in ca. 40 min. Overnight stay. 2nd day - Ascent to Roite ridge, following the paths and tunnels which have been constructed by the soldiers during World War I until we have reached Palon Peak (2.232 m). Way back via Rifugio Lancia and the European trail No. 5, Sentiero Europeo, then following a comfortable forest track until we have reached the parking-lot and our minivan (ca. 7 to 8 hrs.) Back to Rovereto and/or your hotel. Our highlights regarding walking via ferrata rock climbing and canyoning have not been chosen by our alpine mountain guides school but are the preferences of our customers in the 20 years of our activity. Please click on the image for a complete program of our trips and courses.